The leading doctrine concerning how memory is stored is the doctrine that memory is stored by a process of the strengthening of synapses of brains. But what we know about the lifetimes of proteins and synapses contradicts this doctrine. The proteins in synapses have lifetimes no longer than a few weeks (this paper finds that they have turnover at a rate of about 17% per day). The synapses themselves are short-lived compared to the 50-year time span that human memories can last. The two main structural components that can increase in size or number when a synapse is strengthened are called boutons and dendritic spines. Stettler and his colleagues found that the boutons of synapses turn over at a rate of about 7% per week. Dendritic spines in synapses last no more than about a month in the hippocampus, and less than two years in the cortex. This study found that dendritic spines in the hippocampus last for only about 30 days. This study found that dendritic spines in the cortex of mice brains have a half-life of only 120 days. So what we know about the lifetime of synapse components contradicts the claim that human memories (lasting as long as 50 years) are stored in synapses. There is another neuroscience finding that contradicts such a dogma: the finding that there is no increase in synaptic density corresponding to an increase in human knowledge. Synaptic density was constant throughout adult life (age 16 to 72 years), with a density of about 1100 million synapses per cubic millimeter. There was only a slight decrease in old age, with density decreasing to about 900 million synapses per cubic millimeter. 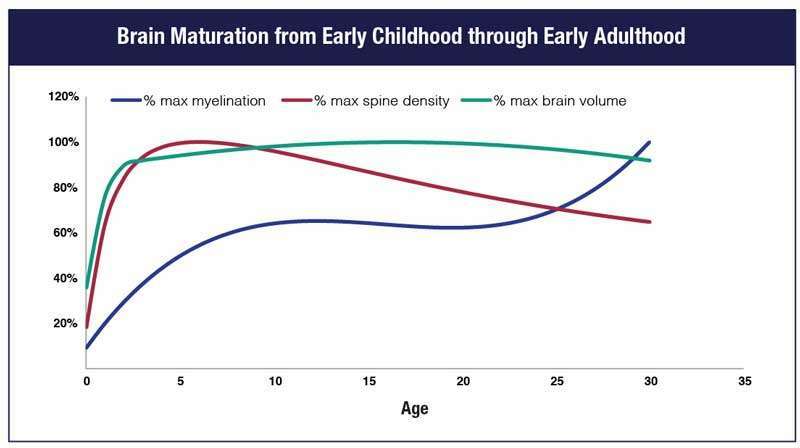 So according to the paper, the density of synapses sharply decreases as you grow up. The following image from a US government web site tells essentially the same story. The red line shows spine density, roughly the same as synapse density. 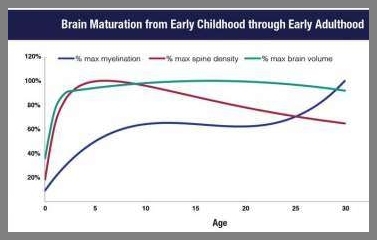 We see this density declining after age 5. Why are such findings inconsistent with the idea that memories are stored in synapses? If our memories are stored in synapses, synaptic densities should increase as memories accumulate. A 40-year old has many more memories than a 5-year old. 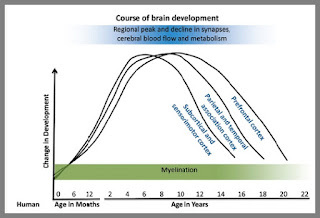 But instead of synaptic densities increasing between age 5 and 16, we see synaptic densities falling sharply. But what about that study of London cab drivers, the one that supposedly showed they had “bigger brains” after learning lots of location information? To become a London cab driver, you have to memorize a great deal of geographical information. A study followed London cab drivers for 4 years, taking MRI scans of their brains. But when we actually look at a scientific paper stating the results, the paper says no such thing. The study found no notable difference outside of the hippocampus, a tiny region of the brain. 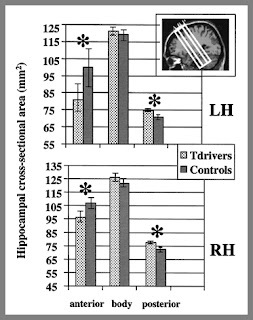 Even in that area, the study says “the analysis revealed no difference in the overall volume of the hippocampi between taxi drivers and controls.” The study's unremarkable results are shown in the graph below. The anterior part of the left half of the hippocampus was about 25% smaller for taxi drivers (100 versus 80), but the posterior part of the right half of the hippocampus was slightly larger (about 77 versus 67). 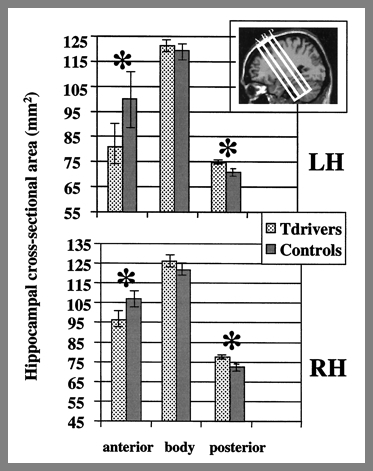 Overall, the hippocampus of the taxi drivers was about the same as for the controls who were not taxi drivers, as we can see from the graph above, in which the dark bars have about the same area as the lighter bars. So clearly the paper provides no support for the claim that these London cab drivers had bigger brains, or brains more dense with synapses. 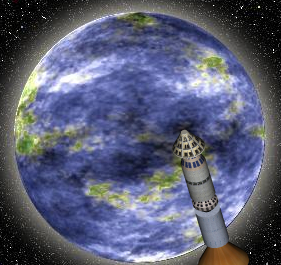 In this case, the carelessness of our major science news media is remarkable. They've created a “London cab drivers have bigger brains” myth that is not accurate. The facts in this matter are completely at odds with the "synapses store memory" dogma that neuroscientists keep teaching (like theologians promulgating some tenet in their creed). The structural materials in synapses are way too short-lived for synapses to be a plausible place where 50-year-old memories could be stored. And instead of our synapses growing denser and denser as we accumulate memories, we have synapses much denser when we are very young with few memories than when we are adults with many times more memories. Why do our neuroscientists keep advancing an unproven theory inconsistent with the facts? Perhaps because otherwise they might have to concede that memory may well involve some spiritual component that cannot be explained through neuroscience. See here for 10 posts explaining why current ideas about mind and memory are in need of radical revision.